Arrange the vegetables in circles so that the colour contrasts, for example cucumber around the edge of the plate, then tomato slightly overlapping the bottom edges of the cucumber. 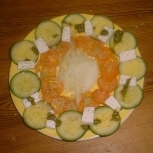 Olives, cubes of feta or thin slices of onion can be overlaid or put in the centre space until the plate is covered. Finally drizzle pesto over the cucumber and tomato layer. It's a strong flavour so go easy! Sprinkle with salt and course pepper, and garnish with a sprig of basil. If you prefer a leafier salad, layer the salad on a bed of mixed leaves, drizzle pesto and then toss just prior to serving. Tasty starter or go large for a main!